Man mag es kaum glauben, aber Leute lesen doch. Text oder besser gesagt Sprache, ist einfach die beste Form der menschlichen Kommunikation. 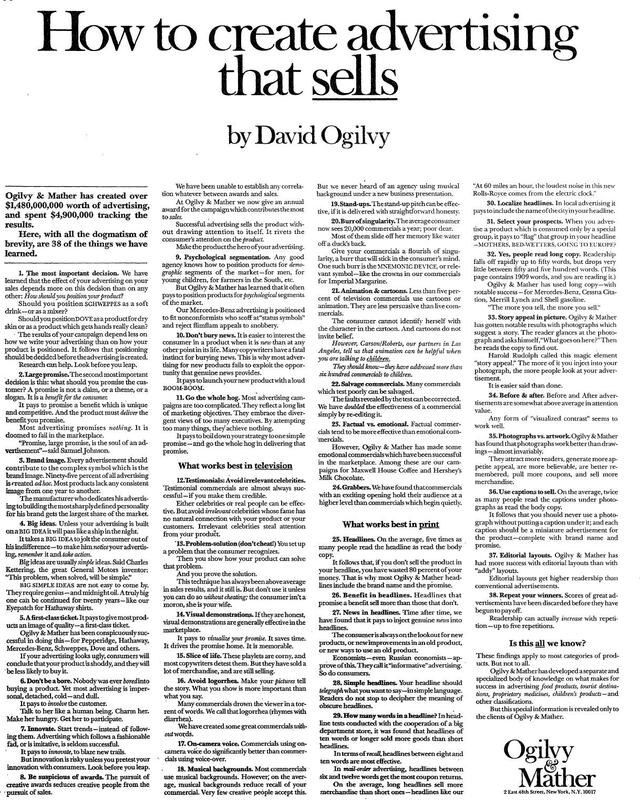 David Ogilvy hat das vor über 40 Jahren schon gewusst. Das ist eine der House-Ads die Ogilvy & Mather in den späten 60er und frühen 70er Jahren zu vielen großen Kunden verholfen hat. Ich denke, der Text ist heute genauso gültig wie damals. Er richtet sich zwar in erster Linie an Werber und Werberinnen, da es im Internet aber vor allem um Text geht, kann man als Webdesigner jede Menge von Ogilvy lernen. Headline. On the average, five times as many people read the headline as read the body copy. It follows that, if you don’t sell the product in your headline, you have wasted 80% of your money. That is why most Ogilvy and Mather headlines include the brand name and the promise. Be suspicious of awards. The pursuit of creative awards seduces creative people from the pursuit of sales. We have been unable to establish any correlation whatever between awards and sales. At Ogilvy and Mather, we now give an annual award for the campaign which contributes the most to sales. Successful advertising sells the product without drawing attention to itself, it rivets the consumer’s attention on the product. Make the product the hero of your advertising. Nächster Artikel: Hör auf ein Perfektionist zu sein! Thanks a lot for posting! I like that the points are verbalized rather straight to the point.